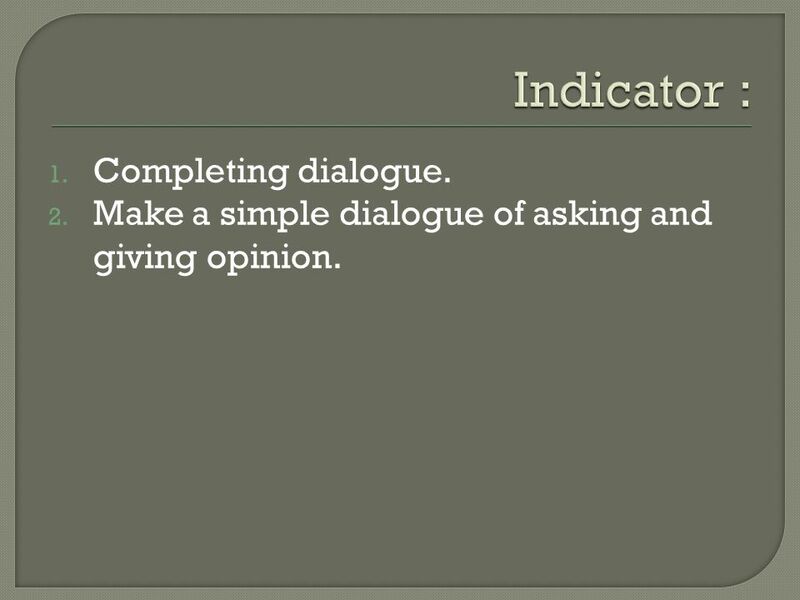 2 Indicator : Completing dialogue. 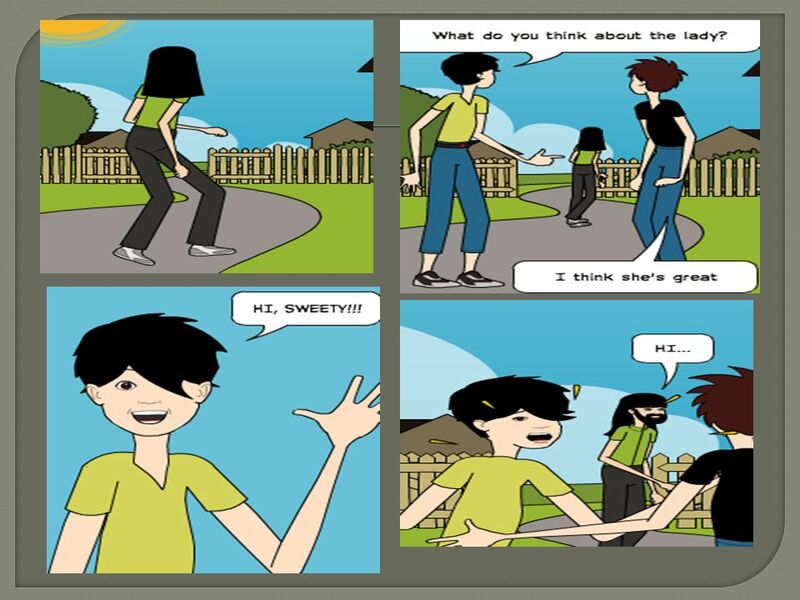 Make a simple dialogue of asking and giving opinion. 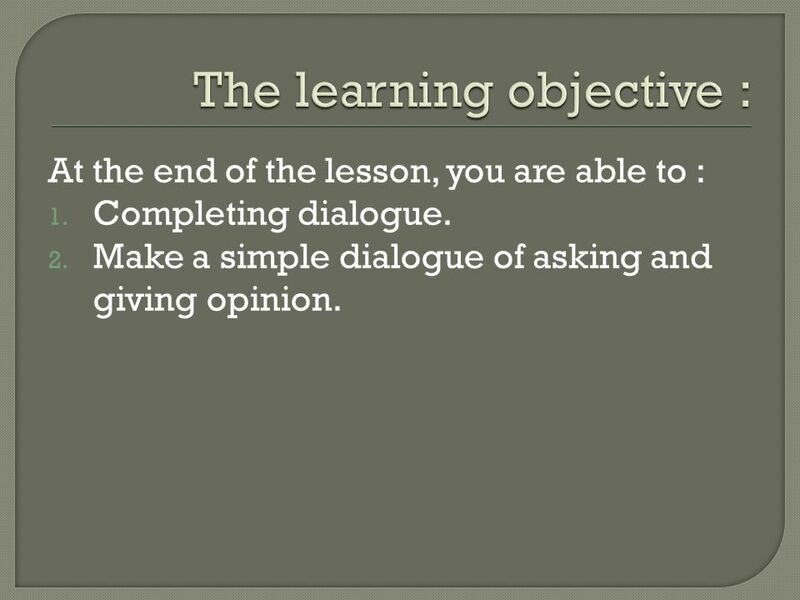 At the end of the lesson, you are able to : Completing dialogue. 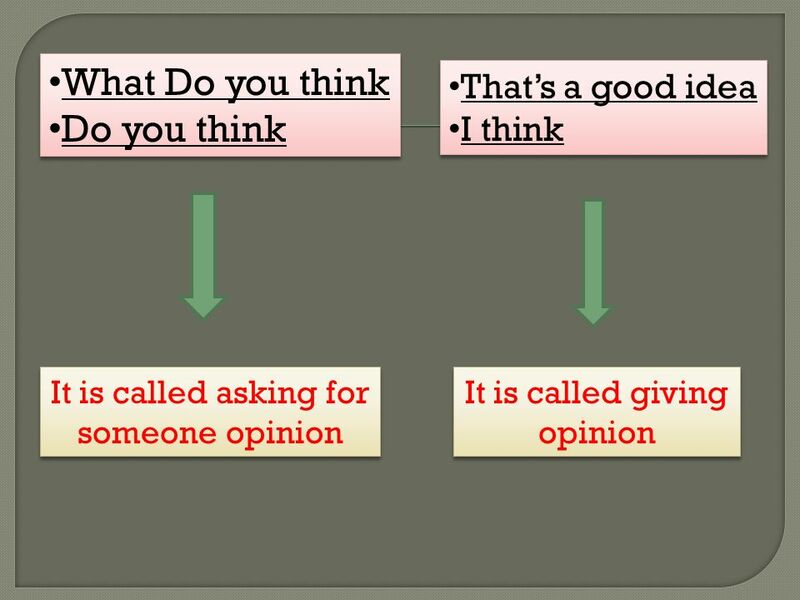 Make a simple dialogue of asking and giving opinion. 7 EXAMPLE Alex and Andi are talking about their plan to have a holiday to Bali Alex : What do you think about going to Bali next holiday? Andi : That’s a good idea. I’ve never been to Bali. Alex : Do you think we should book the ticket from now or just before we go? Andi : I think we’d better book the ticket now. Many people go to Bali in holiday. If we don’t book the ticket now, we might not get any ticket later. Alex : Yes, you are right. 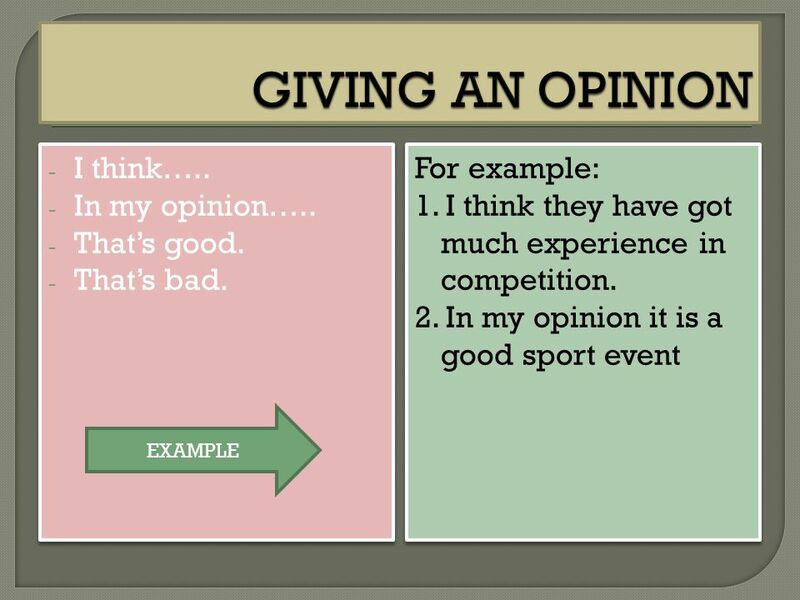 10 GIVING AN OPINION I think….. In my opinion….. That’s good. That’s bad. 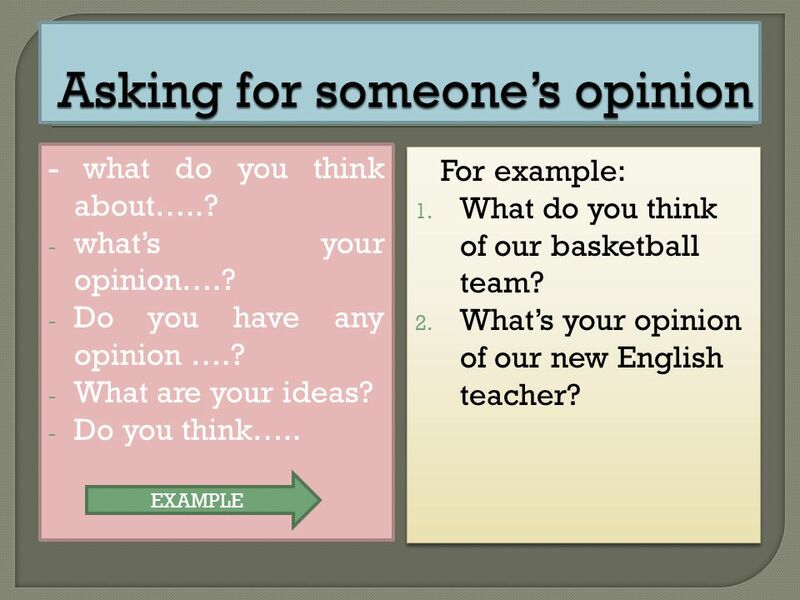 11 Exercise 1: Read carefully and fill in the blank with Expressing Opinion in the box! I think	2. in my opinion	3. What do you think 4. Where do you think	5. What’s your opinion	6. 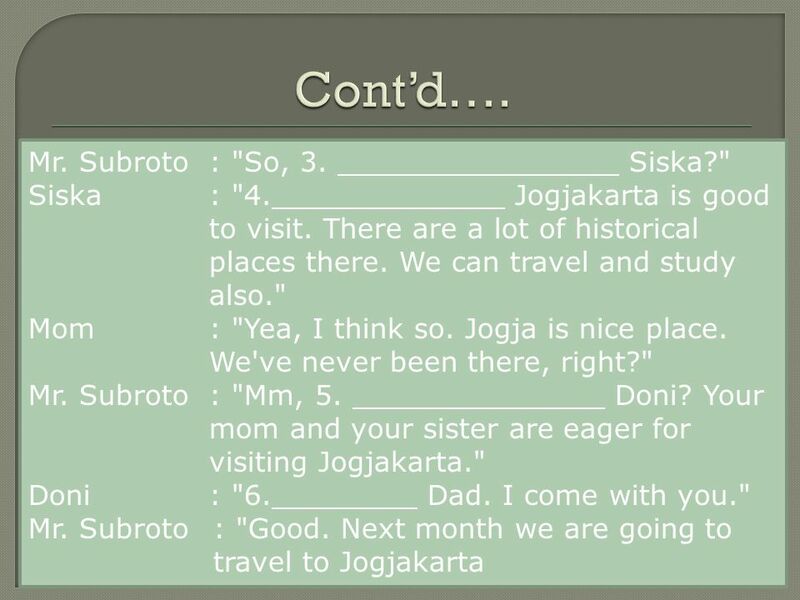 That’s oke Mr .Subroto and his family are talking about a suitable place of their holiday. Mr. Subroto	:"Next month is long vacation, isn't it? we should spend our holiday, Doni." Doni	: " Bali is a nice place to visit. There are a lot of beautiful sceneries over there." 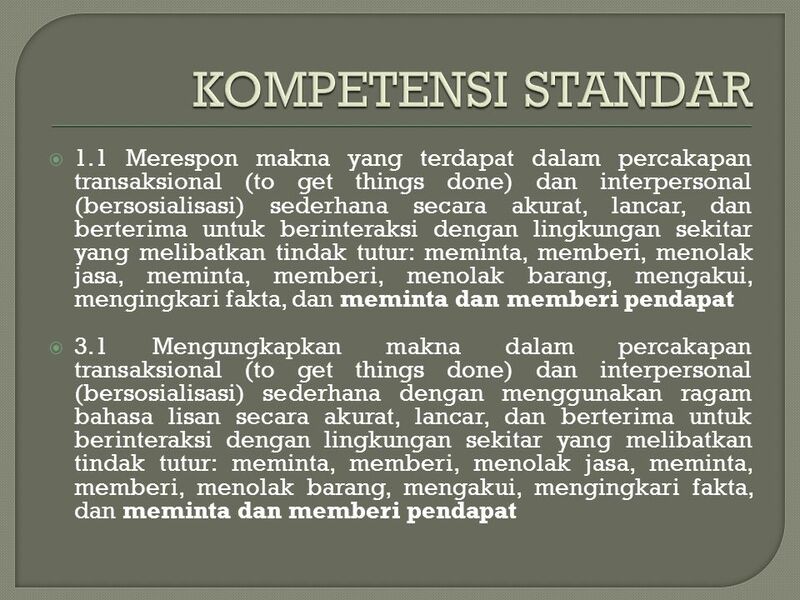 Siska	: "I do agree with Doni. But, we had been there last year." 12 Cont’d…. 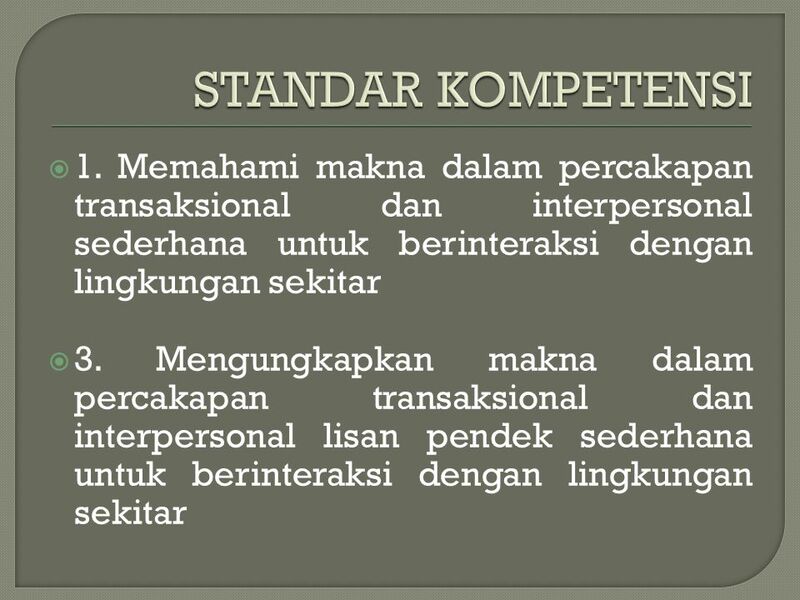 Mr. Subroto : "So, 3. Siska?" 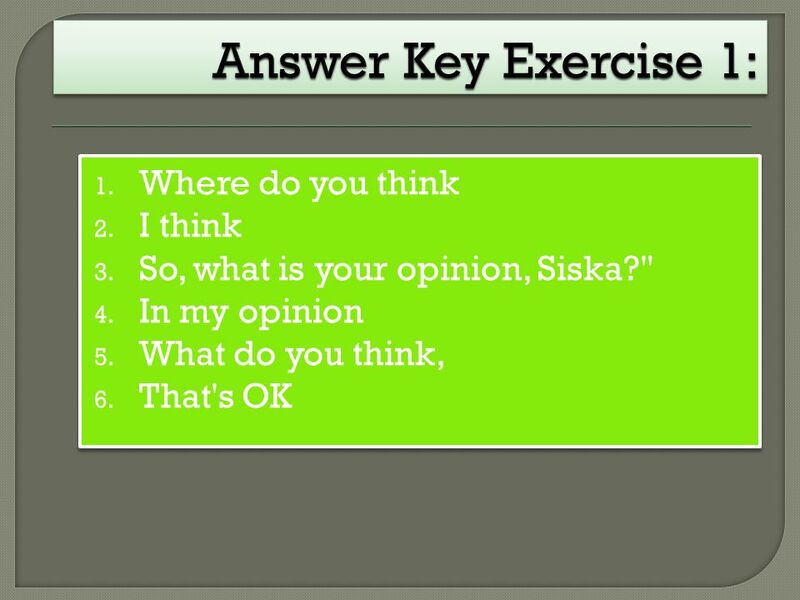 15 Answer Key Exercise 2 : 1. A: what do you think about car? B: I think it is more comfortable than motorcycle. 2. A: what do you think of the magazine? B: I think it is more entertaining than the newspaper. 3. A: What do you think of computer? B: I think it is more useful than television. 4. 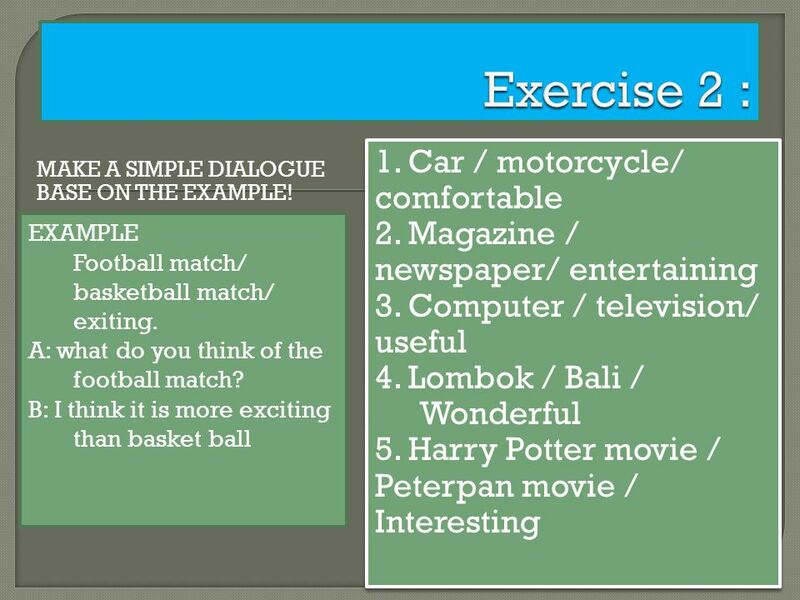 A: What do you think about Lombok? B: I think it is more wonderful than Bali. 5. A: What do you think of Harry Potter movie? B: I think it is more interesting than Spiderman movie. 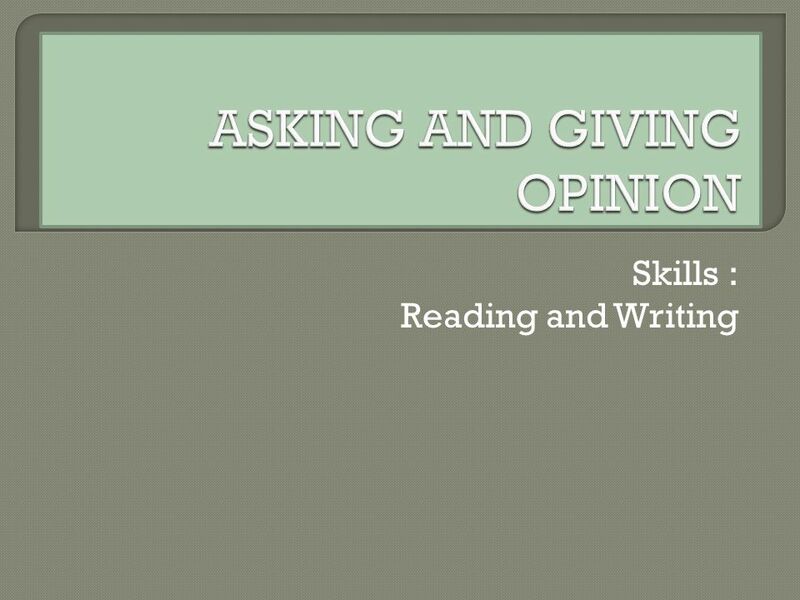 Download ppt "ASKING AND GIVING OPINION"